50029 at Rowsley 16th September 2007 Although no internal restoration work has been undertaken on 50029, a significant amount of work had been undertaken to make Renown look presentable to visitors to Peak Rail. Still looking pristine having made her debut at the diesel gala a little earlier in the year, Renown is seen stabled on 16th September 2007. Although no internal restoration work has been undertaken on 50029, a significant amount of work had been undertaken to make Renown look presentable to visitors to Peak Rail. 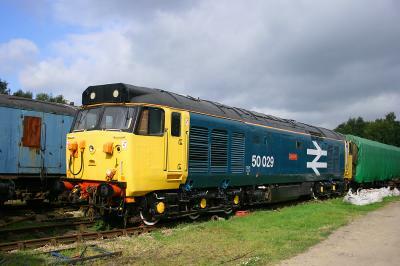 Still looking pristine having made her debut at the diesel gala a little earlier in the year, Renown is seen stabled on 16th September 2007. 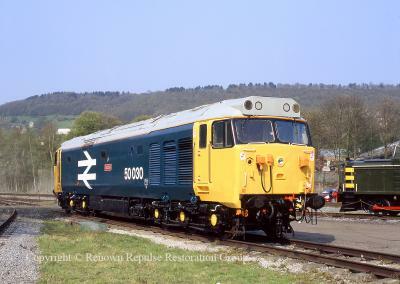 50030 at Rowsley 24 April 2005 Following external restoration 50030 is seen on display in the yard at Rowsley during the 2005 Peak Rail diesel gala, on the afternoon of 5th April 2005. Following external restoration 50030 is seen on display in the yard at Rowsley during the 2005 Peak Rail diesel gala, on the afternoon of 5th April 2005.